The ruling elites, who refuse to accept responsibility for profound social inequality or the crimes of empire, have no ideological veneer left to justify their greed, ineptitude and pillage. Global capitalism and its ideological justification, neoliberalism, are discredited as forces for democracy and the equitable distribution of wealth. The corporate-controlled economic and political system is as hated by right-wing populists as it is by the rest of the population. This makes the critics of corporatism and imperialism—journalists, writers, dissidents and intellectuals already pushed to the margins of the media landscape—dangerous and it makes them prime targets. Assange is at the top of the list. The corporate titans, who often come out of elite universities and are groomed in institutions like Harvard Business School, find these demagogues crude and vulgar. They are embarrassed by their imbecility, megalomania and incompetence. But they endure their presence rather than permit socialists or leftist politicians to impede their profits and divert government spending to social programs and away from weapons manufacturers, the military, private prisons, big banks and hedge funds, the fossil fuel industry, charter schools, private paramilitary forces, private intelligence companies and other pet programs designed to allow corporations to cannibalize the state. In addition to offering no evidence, PropOrNot never even disclosed who ran the website. Even so, its charge was used to justify the imposition of algorithms by Google, Facebook, Twitter and Amazon to direct traffic away from the targeted sites. These algorithms, or filters, overseen by thousands of “evaluators,” many hired from the military and security and surveillance apparatus, hunt for keywords such as “U.S. military,” “inequality” and “socialism,” along with personal names such as Julian Assange and Laura Poitras. These keywords are known as “impressions.” Before the imposition of the algorithms, a reader could type in the name Julian Assange and be directed to an article on one of these targeted sites. After the algorithms were put in place, these impressions directed readers only to mainstream sites such as The Washington Post. Referral traffic from these impressions at most of the targeted sites has plummeted, often by more than half. Challenged by these algorithms and the abolition of net neutrality, these sites will be pushed further and further to the outer reaches of the media. 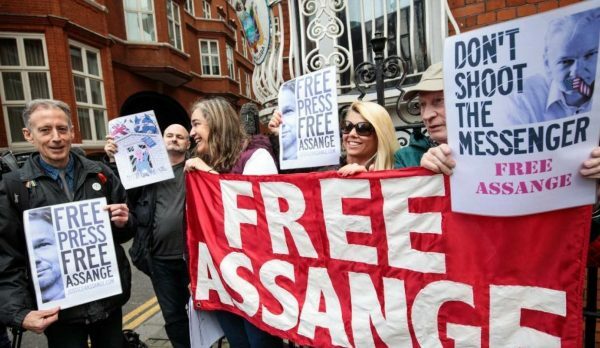 It is so difficult to believe that masses of people, from intellectuals to tech workers, have not risen up in support of Assange. Well, perhaps now that he will be evicted from the Embassy, and set out onto the streets to be seized by the police, people will at last see him and understand that he is a revolutionary hero and as such, needs to be supported.